Oh sister, I feel you! This situation is a tough one. Many of us like to have the luxuries in life. You know, paying the mortgage/rent. Keeping the lights on. Having food to eat. Then we go and have kids. And, wouldn’t you know it? Those little crumbsnatchers want food and shelter too! Unfortunately, the desire to provide basic sustenance to yourself and your family results in you giving away your precious creative time 8 hours a day, 5 days a week. In exchange for funds, of course. Not to mention, those little crumbsnatchers need to be supervised and nurtured, lest they become sociopaths. Factor in the annoying human need to sleep, along with other pesky tasks like personal hygiene and grocery shopping… It’s no surprise you’re sullenly staring at a sum total of 12 seconds a day to be productive with your creativity. Want to make money with your creativity or create community around what you do? Well, good luck with that, amiright?! Only having 24 hours/day & 7 days a week is never enough! What can you do? Give your children away? Quit your job? Rip the space-time continuum?? I will preface my answer by saying: it’s going to be tough. But all is not lost. Many of us have been in this situation and have worked past it. I don’t mean this is as a downer. But it’s really important to understand that – short of straight up neglecting your family and being a no-good employee – you simply don’t have access to the number of hours that the childless and day job-less do. The reason I make this point isn’t to emphasize lack, but to remind you not to get frustrated. You are doing an amazing thing by juggling your creative goals, working to make ends meet, and caring for your family. It will take you a little longer, but you WILL see progress. Even baby steps are forward motion! Because your time is precious, you will want to really get clear on your goals and focus on them. If building a creative business is your goal, focus on the steps that will win you customers and make money. If creating a body of work for show is your goal, don’t get distracted by new techniques. If drafting new patterns is your goal, take a break from starting new projects. Keep your eyes on the prize! If your heart is set on your creative goals, and you focus on them, they will happen. 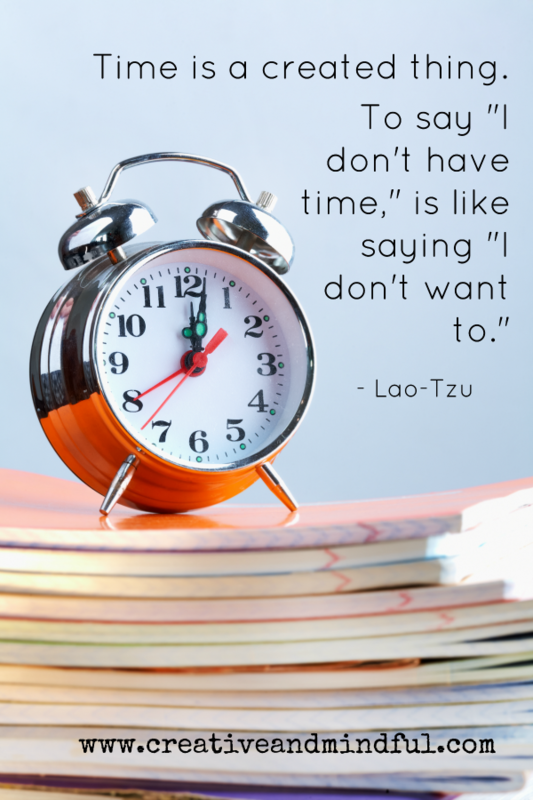 You don’t have time for procrastination and disorganization. Get in the habit of doing things in an simple way. Clean up your messes. Put things away. Document your processes. Stick to a good filing system. You certainly want to give your day job 100%. After all, that paycheck is buying all those food and electricity luxuries. But that doesn’t mean you have to be the best employee ever. It may or may not be appropriate to clue your boss and co-workers in on your personal creative goals – that really depends on your individual workplace. BUT, you can be clear that your family and personal obligations are very important to you. Go above and beyond during your scheduled hours. And then draw a line where your personal time starts. If you work in a place where staying late, taking work home, or being “on call” are the norm, you may face issues. You’ll need to be prepared to deal with this and find a way around it. Refer to focusing on goals/eyes on the prize. Need some stolen time inspiration? I aim to deliver! Victoria Findlay Wolfe developed her 15 Minutes of Play concept because she was tired and didn’t have much time after work to do much more with her quilting projects. Toni Morrison and Alice Munro both wrote immense bodies of work while their kids were napping or while dinner was cooking or early in the morning before anyone was up. I taught myself Illustrator, Photoshop and basic web design while my son took karate classes. The time crunch doesn’t last forever! The best part? If you stick to it, you will suddenly realize your kids are growing up. They can make their own sandwiches and clear their own ears. This equals more time for you to work on your creative goals. And if you stick to it, you will start to see success. For many of us, that means making money from our creative endeavors. Which means you may be able to switch to a part-time job or quit altogether.